Gareth Evans as solo LMES LMP2 champion got a vote here, not because he didn’t deserve it, far from it, but because circumstances dictated that he was the only one of Chamberlain Synergy’s ‘Three Musketeers’ (well, they probably all remember when muskets were around! ), to be present at every race. The Oreca Audi effort scored two separate nominations here, once for the epic Silverstone 1000kms from McNish and Ortelli, against the regulatory odds, and the second for the unfortunate saga of Jean-Marc Gounon’s accident, and subsequent dismissal, from the squad at / after Spa. Hayanari Shimoda’s mercurial, season-long pace was a pleasant surprise for one of our panel too, as was the improved form of the Spyker Squadron in the LMES and FIA GT Championship. The decision to allow Pescarolo Sport to retain a championship point at Silverstone, despite the car having clearly been pushed back into pitlane by the driver, raised an eyebrow here and the overall quality of the racing in the LMES was a pleasant surprise too. But the winner here was a very pleasant surprise indeed – it’s been quite some time since anything other than a Porsche or a Ferrari won in the GT2 class in international racing. That changed on both sides of the Atlantic in 2005 – Europe’s contribution to the change in fortunes of the minnows came early in the season. Spa-Francorchamps was the scene for a great LMES race, enlivened in no small part by a fine showing in the wet race from the Team LNT TVR T400Rs. They were on the ultimate class pace all weekend and in the race, after the Scuderia Ecosse Ferrari stumbled, always looked likely to produce a result to stir the emotions. It looks likely to remain a solo success: Team LNT move on to Panoz in 2006, leaving just one active T400R still racing. 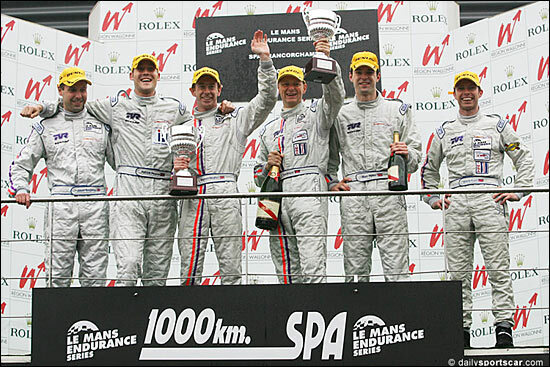 Despite that gloomy prognosis for the future of TVRs in GT racing, this still goes down as a real plus in 2005.
dailysportscar.com’s 2005 European Surprise of the Year is Team LNT’s 1-2 finish at the Spa 1000kms.